Ideally, it is essential we understand what a plumbing vent is before getting to know how to repair it. A plumbing vent refers to a pipe that passes from the fixture and goes up the roof. Mostly plumbing vents are used to remove unwanted gas and odors in the house. It is important to have a plumbing vent system in the house because it helps to emit dangerous gases and prevent from inhaling the same. Also, the vents help to bring oxygen in the plumbing system and supports in breaking down waste products easily. Below is a procedure for repairing a plumbing vent in the Attic. Correcting a mistake: During the initial installation, the plumber may have made a mistake. Before starting your repair process, determine the course of the breakdown and get ways of repairing it. Coupling: Use a vent pipe with the right measurements. Mostly the best pipes for plumbing vents should range between 3 inches to 4 inches. It should be made of a plastic material or a branded rubber. The worst practice is where a plumber would decide to use 3-in pipe instead of 4-in. One could use a 4-inch mostly to prevent the frost from clogging during winter times. Therefore before roofing has been done, it’s important to ensure that the right items were used to install the vents. If we take an instance where the plumber used 4-inch a 3-inch pipe will not be perfect in coupling since it will not be tight enough to connect the 3 inches into the 4 inches. Below are the solutions to support the repair more efficiently. Saw out the Caulked joint. This can be done by removing at least 1-inch of the pipe. Fasten together using the right 3-in into 4-inch PVC coupling. Fitting it by inserting a banded rubber could still work well. 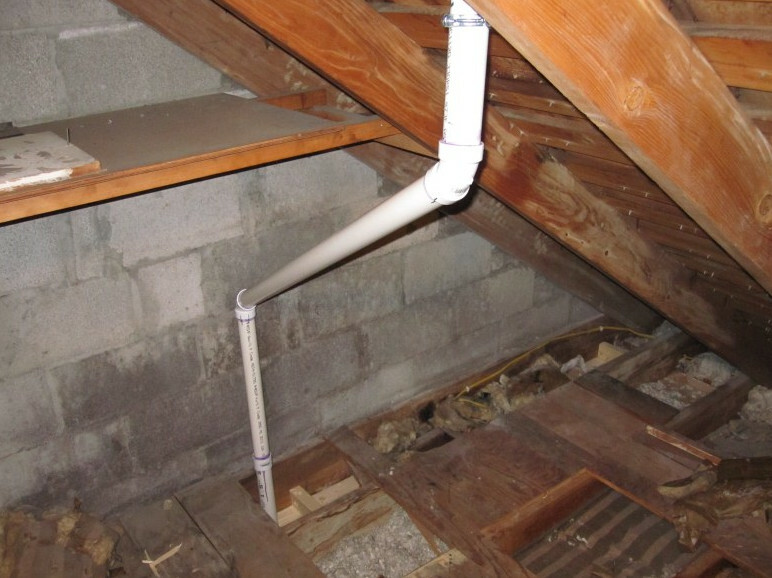 A banded rubber is more preferred because it can be a challenge to glue the PVC fitting in the attic. However, if you decide to use cement while fastening together, ensure you wear a respirator. To prevent contact with the fumes emitted in PVC cement which is dangerous when inhaled. Testing: To ensure that the Vent has been properly fixed, you can opt to spray the flashing area of the roof. The Attic should not have any wetness, and this is a confirmation that there are no more leaks in the system. Screwdriver – 4-in-1 is sufficient for the work. Flashlight – Being in the attic can be a tough exercise since the area is dark. A flashlight supports to see while fixing the vent. A respirator – This is critical if you wish to use PVC cement to take care of your respiration. Glue for fastening the pipes.